From one perspective, Life represents yet another example of a recent Hollywood trend that I find heartening – a renewed interest in realistic depictions of humanity’s probable future in space (which I term “spacesuit films”) that contrast sharply with the appealing fantasies of the Star Trek and Star Wars franchises. The film takes place on the actual International Space Station, and it involves a long-researched project – sending an unmanned probe to retrieve and return to Earth a sample of Martian soil – that might even occur within the next decade or so. Further, given the risks of returning a sample containing potentially hazardous Martian organisms to Earth, the film logically posits that the initial studies of the sample would occur solely on the space station, here conducted by “exobiologist” Hugh Derry (Ariyon Bakare). Regrettably, however, unlike admirable efforts in this subgenre like Gravity (2013 – review here) and The Martian (2015 – review here), and more in the spirit of the less esteemed Apollo 18 (2011 – review here) and 400 Days (2016 – review here), Life ultimately becomes a conventional, and sometimes silly, horror film that offers little insight into how an actual sample return mission might unfold. Unsurprisingly, the film in no way credits any of these precursors, and if they faced a lawsuit from their producers, director Daniel Espinoza and screenwriters Rhett Reese and Paul Wernick would undoubtedly respond that all similarities between their film and the others are merely coincidental; and they would be supported by myopic contemporaries insisting that recent films are only affected by other recent films, and only annoying pedants would ever suggest fifty-year-old films as possible influences. But there is provocative evidence that the filmmakers were at least aware of “Specimen: Unknown” (and perhaps secretly shifted a few dollars to its creators). At one point, physician Miranda North (Rebecca Ferguson) reports that “The specimen’s location is unknown,” seemingly echoing the episode’s title, and in addition to its resemblance to Giger’s Alien, the Martian also looks like a flower, with tentacles that resemble the petals of the episode’s flowers. Finally, with one key difference, the film concludes in precisely the same way that the episode concludes. In discussing the manifest flaws in these three films, my book also noted that they were warnings about the genuine threat posed by unknown organisms – which is why the Apollo 11 astronauts were so carefully quarantined when they first returned to Earth – and Life might be defended as an updated version of that message, needed now more than ever as it becomes increasingly possible to obtain material from Mars and other worlds. However, while the film’s credits do include scientific advisors, there is much about its story that simply doesn’t seem realistic. For one thing, if NASA did undertake to study Martian soil samples on board the International Space Station, they would surely place at least two or three scientists there, not just one, and that team of experts would include a geologist and physicist along with an “exobiologist.” In addition, those researchers would be in constant communication with a small army of experts on Earth, and every step taken would first have to be carefully considered and approved by numerous authorities. Yet despite Adams’s brief complaint about “micromanaging,” it seems that Derry is being allowed to do everything by himself – so when he asks a colleague about whether he should try a mild electric shock to revive the organism, the answer is “It’s your call.” The situation makes sense only as a way to set the plot in motion – for with many people involved, the possibility of a catastrophic error, allowing the specimen to escape, would be virtually nil; but hey, one man can always make a mistake …. Further, one might argue that when it comes to alien life forms, anything is possible, but the plausibility of this particular alien life form can be seriously questioned. Without going into detail about all of its antics, I find it extremely difficult to imagine, given what we know about the history of Mars, any series of events that would cause such a creature to emerge and thrive for hundreds of millions of years (which is what we are told happened). And Derry specifies that the alien is a carbon-based life form that in most ways closely resembles terrestrial life forms; and since all such organisms would die within a minute if exposed to the vacuum of space, the Martian would never be able to cavort about in a vacuum with undiminished energy and flexibility for an indefinite period of time. But this nonsense does provide the film with an exciting scene, and for the filmmakers, that was all that mattered. In sum, precautions will always be necessary in dealing with potential alien life, but no one should have any nightmares about slimy, lightning-fast starfish embarking upon campaigns to slaughter all humans in sight. As another strategy for lengthening their film, Espinoza, Reese, and Wernick might have devoted more time to exploring their characters’ back stories by means of flashbacks and extended conversations; but they were doubtless cognizant of the danger of boring and frustrating viewers who are eagerly awaiting the next alien attack. Yet there is also the danger of saying so little about one’s characters as to make it difficult, if not impossible, to really care about them – and that is another problem with this movie. In some cases, the filmmakers seem to believe that they only need to provide a single fact to make a character likable; thus, we are supposed to like David Jordan (Jake Gyllenhaal) because he is a former soldier, traumatized by his experiences in Syria, who has come to the space station to get away from all of the atrocious things that people are doing to each other on Earth; we are supposed to like Derry because he is unable to walk and now feels “like a bird” because he can easily move around in the weightlessness of the station; and we are supposed to like Japanese astronaut Sho Murakami (Hiroyuki Sanada) because he charmingly watches, via television, his wife giving birth to his daughter Mei. Somehow, though, I must confess that I never really liked any of them. And we are given absolutely no reason to like Adams, North, or Russian commander Ekaterina Golovkina (Olga Dihovichnaya). Reynolds, who is paradoxically capable of both excellent performances (Self/less [2015 – review here), Deadpool ) and appalling performances (Green Lantern [2011 – review here], R.I.P.D. ), is particularly unappealing as Adams; his character is obviously there to provide comic relief, but he delivers all of his funny lines listlessly, like someone completing an unwanted chore. Another way to kill a few minutes of screen time is to toss in some literary references, which at times seems a preoccupation of Life’s creators, though their motives are sometimes unclear. The relevance of having Derry read from John Gillespie Magee’s sonnet “High Flight” (1941) is obvious enough, and one needn’t wonder which undistinguished science fiction series is being recalled when Derry calls the alien “my favorite little Martian.” Also, since almost everything in Star Wars films turns out right, and since almost everything in this film seems to be going wrong, it was cute to have Derry alter the film franchise’s recurring line by saying, when the sample arrives, that “I have a good feeling about this.” Why the filmmakers keep referring to Margaret Wise Brown’s Goodnight Moon (1947) is more puzzling, since the book seems the antithesis of everything the film represents – it is an anti-horror story, wherein a child reassuringly bonds with, and bids farewell to, all of the objects in his environment before blissfully falling asleep without any worries about monsters lurking under his bed. Perhaps, at a moment when he is expecting to die shortly, Espinoza, Brett, and Wernick thought it would be endearing to have Jordan recall that his parents read him Goodnight Moon as a child and start reading its text out loud; but it would be better interpreted as a sign that the stress of battling an evil alien is finally driving him insane. 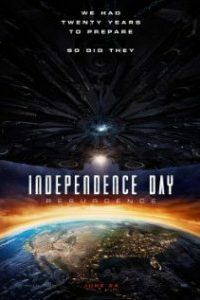 Audiences are also invited to wonder why the film’s Martian organism was named “Calvin.” Officially, the adorable children who won a contest to name the alien decided to name it after their elementary school, and there are several Calvin Coolidge Elementary Schools that one of the filmmakers may have had in mind. The name also brings to mind theologian John Calvin, suggesting that the film might be a fable of predestination, of characters who are doomed to certain fates no matter how much they strive to avoid them. The best-known modern character named for the theologian is Bill Watterson’s Calvin of the comic strip Calvin and Hobbes (1985-1995), and as it happens, the film’s Calvin does resemble a diminutive Martian with four tentacles that Calvin and Hobbes encounter when they visit Mars (as seen on the cover of one Calvin and Hobbes collection, Weirdos from Another Planet ). Are we perhaps being invited to view this film’s story not as an actual event, but rather some bored astronaut’s playful fantasy? 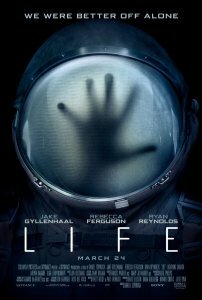 Like “Calvin,” the film’s title – Life – has so many possible meanings that one cannot be sure what the producers had in mind (except avoiding some more accurate but déclassé title like The Monster from Mars). Certainly, there are portentous lines of dialogue conveying the dignifying pretension that the film is offering serious commentary on the very nature of life – as when Derry initially comments that the alien will enable humans “to learn a lot about life” and later observes that “Calvin doesn’t hate us, but he has to kill us in order to survive.” But it is ludicrous to imagine that Calvin embodies the way that life has to function: yes, many creatures around us are predators, but “in order to survive,” they are necessarily careful and selective in their actions. There is a reason why there are no existing predators that devote all of their time to attacking each and every creature that comes into view – the characteristic habit of cinematic alien monsters – because it is a “strategy” that would quickly lead to extinction. In this case, if Calvin does succeed in its quest to kill every human on board the space station, it would soon starve or freeze to death; a policy of cooperating with its human captors would make much more sense, and would actually demonstrate the “intelligence” it is said to possess. I prefer to believe that the film’s title is actually a reference to Monty Python’s The Meaning of Life (1983) – the filmmakers’ confession that their film is a series of entertaining incidents that cumulatively say absolutely nothing about “the meaning of life” – or to the board game The Game of Life – a purportedly educational but actually meaningless exercise. A final issue to consider involves my own life as a science fiction film reviewer: I generally do not like horror films, and when I prepare my lists of suggested future films to review, I tend to avoid obvious examples of the genre. And yet, a hurried survey indicates that of the 102 films I have so far reviewed for Locus Online, 26 – or about one-fourth – can be comfortably characterized as horror films. The question is: why do so many science fiction films begin in novel ways, but ultimately devolve into routine horror films, as some fantastic analogue to Friday the 13th’s Jason slaughters one character after another? In the 1930s, when possible developments like space travel and tinkering with life itself were unfamiliar or unimaginable to most people, it was understandable that so many science fiction films took the form of horror films, sternly warning that “There are some things man is not meant to know.” But today, when so many scientific advances have materialized without having disastrous effects, one might imagine that filmmakers would find other, more interesting tales to tell about space adventures and new inventions instead of continuing to insist, for the one-millionth time, that such initiatives are sure to have catastrophic results. Science fiction, John W. Campbell, Jr. and others have argued, is the one form of literature that accepts and embraces the inevitability of change; yet looking at its cinematic relative indicates instead that, perhaps, some things never change. Excellent review. Act I was interesting: the crew were nice to each other; where is the film going? Then from Act II on, it was all telegraphed. No real surprises. Too much CGI. The idea of the film (exo-life) definitely needs to be explored.